This is the first spin-off from the original Rainbow Riches Slot, it was first released for the 777 cabinet by Barcrest games and has never been released as a standalone game. It features the massively popular progressive pot feature, this is obtained in the same was as the original by landing 3 pot symbols on reels 1-3. 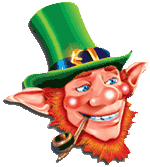 Once you obtain the 3 symbols you will be greeted by a dancing leprechaun with a spinning wheel of pots consisting of 5 bronze pots, 4 silver pots and 2 gold pots. The Bronze, Silver and Gold pots start at £50, £150 and £250 respectively. The gold pot will increase by 2p every time a credit is played and the other 2 will increase by 1p per spin. The pots aren't the most frequent feature so they can reach large amounts, it's quite normal to find Gold pot sitting at £500 for weeks before anyone is lucky enough to win it. The pots of gold slot also features the gamble option, when any win is awarded just press 'gamble' on screen to be taken to the infamous Barcrest 'pie gamble', simply hit start and stop the dial in the blue area to increase your winnings! We have loads of great videos of rainbow riches pots of gold in our top 50 Rainbow Riches videos section.